Paul Picot is pleased to announce that it will ride for the entire MotoGP on the wrist of the current Superbike World Champion Ben Spies! Emotion, dynamism and performance make up this powerful duo: while Yahama team rider Ben Spies switches on racing enthusiasts as he speeds along, Paul Picot appeals to motorbike aficionados with a passion for high-end and high-performing watchmaking. A limited edition of Paul Picot\'s C Type Plongeur 48 will be dedicated to the Number One racer. 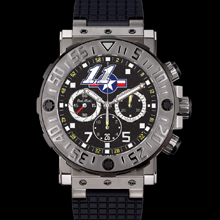 Among the special features of this distinctive timepiece: a dial entirely made of carbon fibre, the 9 o\'clock counter in a disc brake look, and of course Ben Spies\' logo - the stylized number 11 -, which gives special character to the overall design. Be prepared for a thrilling new season!